Canadian customers seeking Geo's recordings: email shop@fjordstone.com for special shipping arrangements. Please include the recording title and quantity you would like to purchase. Geo Athena Trevarthen (formerly Geo Cameron) carries a family tradition from the Irish and Scots Celts focused on manifesting God, the Mother, Father and Creator's will on earth through shamanic practice. Traditionally, her ancestors include many of the High Kings of Tara, such as Niall of the Nine Hostages and Conaire Mór. Tradition also places her within the family of the shaman poet Amérgin. Geo studied with Dr. Michael Harner and Sandra Ingerman for six years, completing the Foundation for Shamanic Studies' Three-Year and Masters Programs in Shamanism and Shamanic Healing. She studied Gestalt therapy with Dr. Rudolph Bauer, and is an ordained minister in the Circle of the Sacred Earth, a Church of Animism fostering cross-cultural shamanic practices. Geo holds a B.F.A. and a Master of Science in film, and has used the media of film, television, art and music to convey the mythic truths of the tradition, including the story for the Star Trek: Voyager episode "Sacred Ground." Geo Athena Trevarthen's journeying music reflects her Celtic heritage with bagpipes, bodhrans, and layered chants in Old Gaelic. Each program ends with a clearly signaled callback. UK/European customers: You must purchase Echtra directly from the artist's website. Click here to purchase this CD from the artist. Echtra features a chant to the Trinity in Old Irish; a bagpipe drone and drum; and a version of the O-I-V chant found in Iolo Morgannwg's Barddas, a collection of archaic Welsh texts. This is the first CD ever recorded in Old Irish! Geo's first recording, available only on cassette, contains the haunting and beautiful Chant to The Mother, Father and Creator, performed in Old Scottish Gaelic, a clear, singing bowl journey entitled Bell, a standard drumming journey, and a stirring journey with bagpipe and drums. 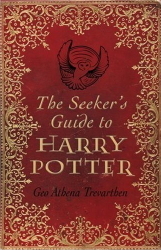 The Seeker's Guide to Harry Potter offers 'seekers' of all kinds profound and fascinating insights into the narrative themes, symbols and mythic elements encountered in the Harry Potter books. Drawing from diverse spiritual and scholarly sources, it is an open-minded guide to the rich layers of meaning and symbolism we encounter in all seven of the novels. The Seeker's Guide doesn't try to 'read' J.K. Rowling's mind about the symbolism she may or may not have meant to put in the books, but to read the symbols as they appear, with some of the layers of meaning that they have traditionally held. Drawing from anthropology, theology, psychology and the history of the human experience of the Sacred, The Seeker's Guide to Harry Potter offers fans of any or no spiritual faith a deeper sense of magic and meaning in the novels and in their own lives. 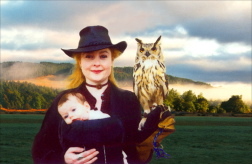 Dr. Geo Athena Trevarthen developed and taught the Open Studies course on Harry Potter at the University of Edinburgh, where she gained her PhD for her groundbreaking work on Celtic shamanism and is currently a Postdoctoral Fellow in the School of Literatures, Languages and Cultures.